Two people begging in central Stockholm were attacked with acid in what police suspect was an unprovoked hate crime. One of the victims – who are reportedly EU migrants – suffered facial injuries after a passerby threw a corrosive liquid at him. 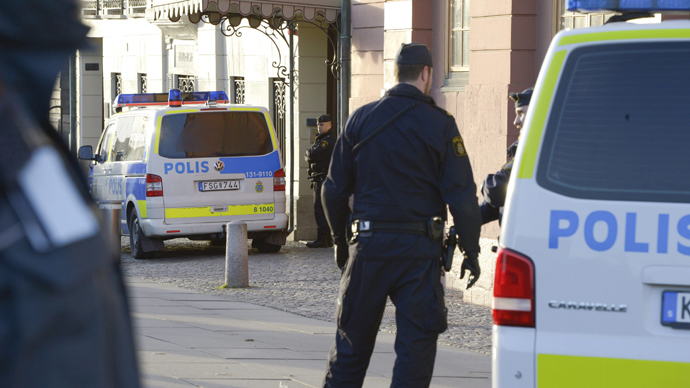 The incident happened at lunchtime on Friday in Berzelii Park in the Swedish capital. A man and a woman, described by Stockholm police as EU migrants, were apparently begging at the time of the attack, according to The Local. The woman escaped without injuries, though parts of her cloths were damaged. The man was taken to Karolinska Hospital in Solna where a team of medical staff, wearing protective suits, treated his face for burns. It is unknown at present what type of acid was used by the attacker. “He had a swollen face and was taken to hospital. His injuries are unclear and we do not know how extensive they are,” police spokesman Tommy Dimitrakis told the Swedish newspaper Aftonbladen. Police said both the man and the women had been discharged on Saturday. This is only the latest attack on beggars in Stockholm. Two weeks ago a person was attacked outside a supermarket with fireworks after asking for money in public. The number of rallies by anti-immigration protesters and neo-Nazis has risen sharply over the past three years in the Scandinavian country, and has reached record levels despite a decline in the number of far-right groups, according to the anti-racist Expo Foundation. From 2013 to 2014, the number of such incidents increased from 2,334 to 2,864, or 23 percent, reaching a rate of seven to eight a day. “It’s an enormous increase. Just in a couple of years, in three years' time, it has almost doubled. We have never seen this many activities before,” Anna-Sofia Quensel, Expo investigator, told Swedish Radio on Tuesday, The Local reported. “The major part of activities is the spreading of propaganda, meaning sharing flyers, putting up stickers, often by night,” Quensel said.